Simple Solutions for Back Pain is an easy set of practices and tips you can do at home or at work. The series has evolved through my personal journey of healing, rehabilitation and recovery, combining tested techniques used with my students. Our bodies aren't static. I encourage you to listen to the signals and messages of your body every day and adjust your movement needs based on those messages. These Pilates and Movement programs include: Foam Roller Progressions, Back Care Progressions, and Simple Solutions for Back Pain. I designed all of these programs to help you improve your balance, increase flexibility and improve your posture. And, most importantly, to feel better. 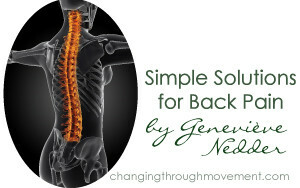 Why Create the Simple Solutions for Back Pain Series? 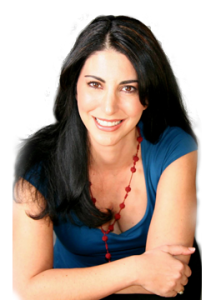 Many of you have asked me about my personal practices and how I manage my back, neck , jaw and shoulder pain, the result of multiple car accidents from my early twenties. The most serious happened within 18 months of each other, leaving me with severe injuries and chronic pain (read more of my story here). My hope for you is back pain relief, increased flexibility and a stronger, more balanced body. I hope to help you move out of pain and live with greater joy, ease and vitality. Most of all, my wish for you is a better quality of life! Below is the multi-part series. To view, please click on each title to expand. Do you wake up with Back or Neck pain? These basic small changes can make a big difference in your pain level. Sleep on your side with a pillow between your knees with you legs bent. Take pressure off of your back by keeping your knees an inch or two higher than your hips. 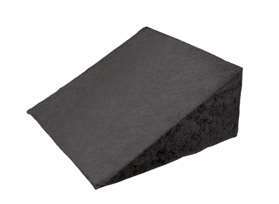 Keep your head supported on a comfortable pillow that allows for proper cervical support. Bed, Bath and Beyond have a generous selection of pillows that won’t break your budget. Have a custom Neck Pillow made for sleeping. My Chiropractor helped me with this and it helps so much that i invested in an additional travel sized custom pillow. It goes wherever i go! These small changes can make a big difference in your pain level and quality of your sleep. Take a moment today to notice your alignment when sitting at the computer or driving. My simple solutions for back pain relief come from personal experience and successful application of these recommended practices and movements. I’ve spent the past 3 decades in continual recovery and management of my jaw, neck, shoulder and back pain from car accident injuries and genetic arthritic challenges. Receiving back pain relief from easy adjustments and daily practices has made a huge difference in my ability to cope with pain when it flares up, and prevent flare-ups from happening as often. My sincere hope is that these tips lead you to find back pain relief as well. Seated posture is the easiest for us to let slide, yet luckily, also a simple one to correct. Check your seated posture. Specifically check your alignment while working at the computer, driving and watching t.v. Keep your knees in alignment with your hips. Place your feet approximately hip-bone width apart. It can be helpful to have your knees slightly higher than your hips (an inch or two). Avoid crossing your ankles or legs. In fact, make a commitment to this today and always. Sitting with our legs crossed puts the pelvis in an uneven position and consequently changes spinal alignment. We all have been known to wear our shoulders as earrings on occasion! Check in with yourself and practice these shoulder placement tips. Allow your shoulders to be relaxed and down. Create some space between your ear lobes and shoulders (in other words, avoid wearing your shoulders as earrings!). Take a moment today to notice your alignment while sitting at the computer or while driving. Notice the placement of your head and shoulders as well as your feet. Small postural adjustments such as the ones above can provide noticeable back and neck pain relief and improve your posture significantly. There are a couple of options for purchasing the wedge. Look it up at OPTP, a terrific company that offers physical therapy products and a large selection of back care products. Another great resource is the Better Back Store. A simple and inexpensive solution that I use beneath my computer desk and Home office set-up is a 3-ring binder. Any office supply store will have various binder options. Let me know if you have questions or comments. I appreciate hearing what you discover on your road to increased energy and vitality. If you find relief, please pay it forward by sharing this (and other Simple Solutions for Back Pain tips) on FB, Linkedin or via this email. This simple exercise provides gentle traction, is a safe lumbar stretch and feels really good! In this 3rd part of SSFB pain series, I’d like to share a little bit about the Back Systems machine and, specifically a low back stretch. The stretches on BackSystem3 are easy, safe and effective. I encourage you to try this machine if you have access to one. Diana Bailey, my dear friend and longtime mentor introduced me to this machine 26 years ago in Denver. 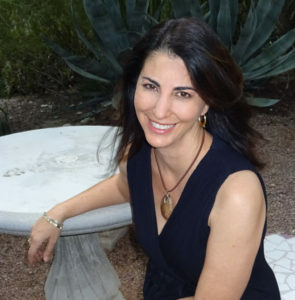 Before I was strong enough to try anything Pilates or even Pre-Pilates related, Diana worked with me for several months on the Back Systems machine, the Swiss Ball and the Foam Roller to improve my alignment, increase my flexibility and decrease muscle spasms in both my Upper and Lower Back. During that first year of working with Di, I was going to Physical therapy, Massage Therapy, and Pilates on a weekly basis. The PT stretches helped and the balance and stability training on the Ball made me internally stronger; however, the Back machine consistently gave me relief . Every single time! It seemed odd to me that a little machine with simple stretches could give me such tremendous relief. Back Systems allows you to stretch in a positions that creates gentle traction on your lower spine, work you abdominals. There’s also a terrific series for Shoulders and Lats which I’ll cover later on. For the past 25 years, I’ve kept a BackSystem3 machine in my Pilates studios and continue to use it myself as well as with clients every week. 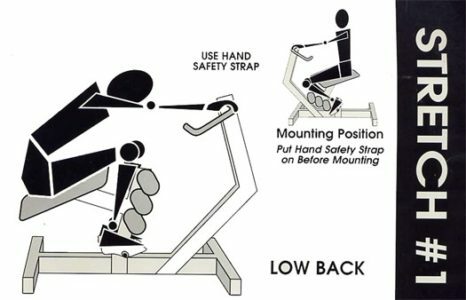 Try the first exercise on the Back System3 machine. Heat therapy is highly effective. Whether your pain is low back, upper back or a combination of both, heat therapy is an inexpensive and easy way to get relief. With so many experts, products and varying opinions it can be confusing and overwhelming about how and where to start. I’ll share details of my successes and failures with therapies in posts to follow. For now, here’s another simple solution for relief. A simple starting place is a heat pack. This is Dry heat therapy. If you don’t have one, you can purchase a heating pack that warms up in the microwave at Target, Walgreens, most Health food stores and spas. Ask me if you need help. Packs come in a variety of forms; including, rice filled and gels. My personal preference are cloth packs filled with organic rice. Apply the warmed pack to the part of your back that aches and begin with 10-15 minutes. Consider 15 minutes On- 15 minutes Off. 10- to 15 minutes is generally sufficient; however, if your pain is intense, you can increase your time to 20 minutes. Safety Precaution: Heat should not be used for a new injury. This will prolong your healing process and could increase inflammation. The general rule of thumb is ice with a new injury for bruising, swelling and pain. Ice for 48 hours as much as you can- 15-20 minutes On- 15-20 minutes Off. Wait a half hour and then begin again. With many injuries, after 48 hours , it’s safe to begin using heat. Please check with your Doctor before beginning any therapy after an injury. Poor posture is a primary cause of back pain. Check your posture and counter balance poor habits. Being hunched over at the computer or twisted in some way, sitting on a chair without lumbar support and keeping your back overly arched , working at your desk for long hours at a time, driving, talking on a cell phone, standing long periods of time without supportive shoes, scrap- booking, painting, cooking, – these are ways we get stuck in a non-supportive postural position and create or exacerbate back pain. Align and strengthen the muscles in your back to hold your bones in the right place. Train your posture on a consistent basis by increasing your awareness, improving your gait, and incorporating postural correction techniques into your regular exercise program. Learn good posture for sitting, standing, and sleeping. Take daily steps to change, condition and re-condition your muscles and ligaments. When you change poor habits, you simultaneously retrain your muscles to hold correct spinal alignment. Our muscles are designed to hold our bones in the proper alignment. Lie on the Foam Roller 5 to 10 minutes in the morning and evening. Practice the Pilates Roll down series on the wall. Cultivate a daily Lower Back Stretch series. Incorporate basic Yoga Asanas every morning or in the evening before bed. A few rounds of Sun Salutations are an easy way to increase flexibility. Invest in quality computer and desk chairs. This can be a game changer when dealing with chronic neck and back pain. Use lumbar support while working on a computer or driving long distances. Practice Pilates mat work 3-4 times a week. Back pain and Muscle aches are often caused by dehydration. I know, I know, I’m a broken record with hydration reminders and especially for my Tucson clients. This is important, though- really important! Even mild dehydration can bring on pain. 1. When Back pain or muscles aches come on, drink 2 to 3 glasses of water immediately. Many factors can cause dehydration; including, certain medications and high temperatures. In our extreme desert temperatures, it’s even more vital to drink 8 to 10 glasses of water a day. 2. 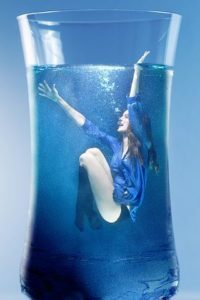 Try drinking a glass of water a half hour before meals. In addition to staying well hydrated, drinking a glass of water 20 to 30 minutes before your meal can aid digestion significantly. 3. Consider starting your day with 2 or 3 glasses of water. 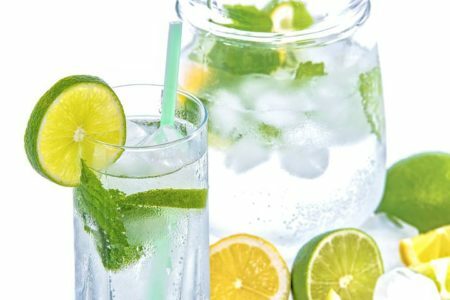 Enliven your taste buds by adding fresh lemons, limes, lavender or mint. Get creative!! 4. Drink Herbal teas throughout the day and after Dinner. 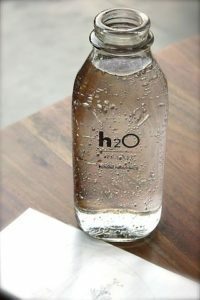 This is a simple and effective way to complement your water intake and increase overall hydration. I prefer to get vitamin C from food in the most natural way possible. Vitamin C is a powerful antioxidant with many benefits. In addition to improving the immune system, helping to lower cholesterol, improving symptoms of asthma, and a way to prevent various diseases, vitamin C can help relieve back pain. Among its potent benefits, vitamin C aids in the repair of muscle tissues. 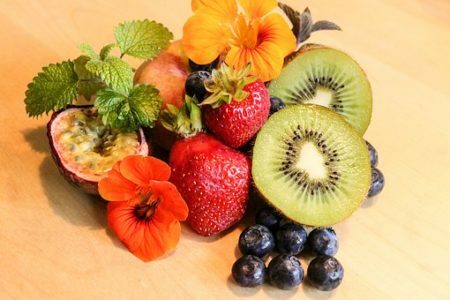 Try to get vitamin C from food: Organic Fruits and Vegetables ideally. 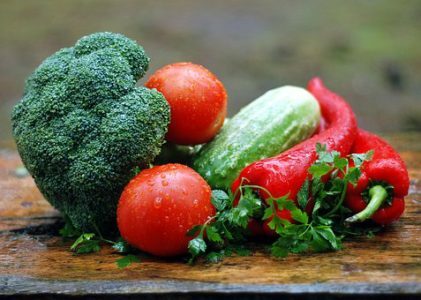 Improving your nutrition, and boosting your immune system can help manage back pain and often times decrease pain significantly. *As always, please speak with your Medical doctor before adding or increasing any supplements. Stretch Your Chest & Shoulders with this Simple Foam Roller Exercise. How the Foam Roller can help You stretch Chest and Shoulders Lying on the foam roller effectively releases tension and also aligns your spine, improving posture. When you add shoulder range of motion exercise, you open your chest, which releases your upper back and stretches shoulder and arm muscles safely. Lie on the foam roller lengthwise and imprint your spine; start with your arms by your sides on the floor. Inhale – Lift your arms in line with ears while keeping your spine imprinted. Exhale – Lower your arms to 3 or 4 inches above the floor. Reminder: keep your abdominal muscles engaged to help protect your back and strengthen your core. For optimal alignment, make sure your head is on the foam roller completely and if possible, your tailbone too. Simply lying on the Foam roller and allowing your spine to imprint can improve your posture significantly. The arm lift exercise lengthens your spine while also opening the chest and shoulders. Have you been on a foam roller yet today? Be good to your spine and add more foam roller work to your private Pilates sessions and home routines. Protect your shoulder joints while keeping your muscles flexible. Before Weight Training for Upper Body. This triceps and shoulder stretch is a simple way to warm-up arm muscles as well as your shoulder/rotator cuff. Keeping the hamstrings stretched is an important part of maintaining lumbar flexibility. Follow the instructions for how long to hold and how man reps., etc. Please be careful, none of these stretches are held very long, especially during the first few repetitions. The top hand/bar position is more challenging, so if you want more of a stretch, place your hands on the top rung. After the parallel leg position you can internally rotate your leg and change the stretch to your outer hamstring muscles. (no photo shown). Keep your foot flexed. Or schedule a session with me or one of my teachers at the studio and ask us to take you through a private session using this highly effective system. If you don’t stretch your hamstrings on a regular basis, add these hamstring stretches to your home routine for preventative back care, back pain relief and gait improvement. Body Fundamentals Tucson studio clients, you’re welcome to come by during business hours any day and use the Back System machine. Just give us a call and check in before you come by in case we’ve run out for lunch or the machine is being used.